The popular culinary show, Master Chef India Season 4 was airing on Star Plus from every Monday-Saturday at 22:30 hours. The show had its premiere episode aired on the national channel on 26th January 2015 and had its last episode aired on 11th April 2015. The finale episode went on air on 12th April 2015 at 21:00 hours. This was the 4th season of MasterChef India produced by the renowned production house Colosceum Media Pvt. Ltd. The show is a cooking competitive show based on the parent show British MasterChef. MasterChef Australia, MasterChef: The Professionals, MasterChef Asia, Junior MAsterChef India are some of the popular shows under the same belt. There are quite a few more MasterChef shows round the world based on the parental show. In India, MasterChef was first launched on national television in the year 2010. Starting from 2010, the show has been airing season after season every year. The season 1 winner was Pankaj Bhadouria, followed by Shipra Khanna as the winner of season 2; the season 3 winner was Ripudaman Handa. The season 4 winner was Abu-Dhabi based NRI Nikita Gandhi. The judges’ panel of season 4 saw the Michelin superstar Chef Vikas Khanna, Chef Sanjeev Kapoor, and Chef Ranveer Brar as the judges of the show. Beating her co-contestants, Bhakti and Neha, Nikita bagged the title. Neha Shah and Bahkti Manekar became the first and second runner up respectively. Nikita owned the title after 11 weeks and 67 episodes of hard work and slogging. 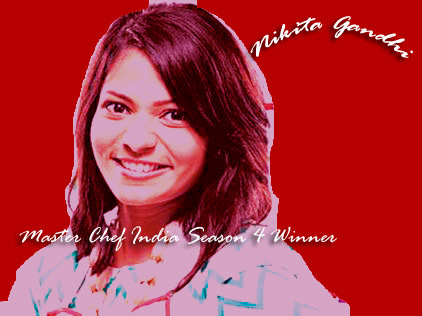 Nikita was awarded with the golden chef coat for winners and received a sum of 1 crore INR. The season 4 of the popular culinary show was entirely a vegan cooking show, creating a history in itself. All the last 3 seasons had both non-vegetarian and vegetarian recipes as part of the show.